Lighting design can be more creative than you probably ever imagined. The possibilities have never been more evident than now — when looking at the top lighting trends for 2017. Lighting designers have given us an overwhelming array of choices to consider. Some are futuristic in style, and others are inspired by the past. Even styles reminiscent of the past are being shaped by visions of what lies ahead for the future. Stylish new sustainable and energy-efficient options are becoming increasingly important for contemporary environments, even when decorating retro-inspired homes. LED lighting is the top lighting trend for 2017. This is a trend that, by all appearances, is still in its infancy. Based on projections posted by the US Department of Energy, we’re confident in predicting that the LED lighting trend is one that has staying power; we expect it to gain traction in 2017 and remain relevant well into the coming decades. The US Department of Energy forecasts that LED lighting will comprise 75% of all lighting sales by the year 2030. This is one of those trends that makes perfect sense. When total energy costs are considered over the long term, LED lighting is both more affordable and more practical than other alternatives. While the upfront costs for LED lighting do tend to be higher, the overall energy costs associated with LED lighting are considerably lower when calculated over an entire lifespan of use. If you’re a homeowner, you can get in on this trend by evaluating and budgeting for a switch to LED lighting in your home. This is one of those tangible investments that you can both enjoy now and profit from in the long term — which explains why so many homeowners are jumping on the trend. If you’re an industry professional, you’ll likely find it rewarding to educate your customers about the benefits of LED lighting. It’s a win-win solution for everyone. Residential architects have reported an upswing in demand for LED lighting, particularly in the kitchenand bathroom. 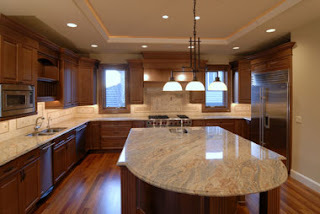 LED cabinet lighting is in especially strong demand. There’s also significant interest in outdoor LED lighting. As consumers embrace the trend towards outdoor living, many are revamping their patios, porches, driveways and garden areas with additional lighting. 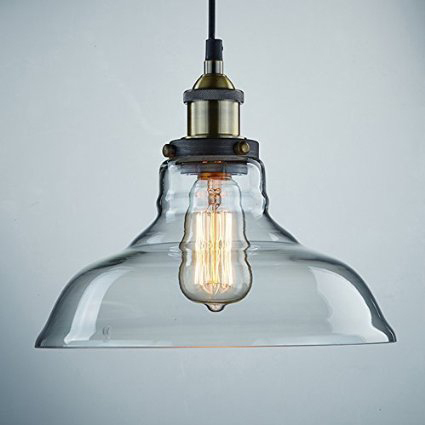 Industrial style pendant light fixture with retro Edison bulb. This light fixture is also capable of utilizing LED bulbs. There are people who embrace the latest technology. Then there are people who head in the opposite direction. When it comes to lighting, significant numbers of people are currently interested in nostalgic details, as evidenced by the recent popularity of the vintage Edison bulb. These eye-catching incandescent bulbs harmonize well with a variety of different design aesthetics. They complement farmhouse style homes, industrial lofts, contemporary apartments, mountain modern condos and a wide range of other trendy interior environments. Retro Edison bulbs are available in both incandescent and LED-friendly models. Warm metals are trendy for 2017, and they’re making appearances in many places throughout the home. Many lighting purveyors are getting in on the trend, offering a variety of lovely gold-colored pendant lights and various gold sconces and lamps. Pendant lighting isn’t a new trend, but it remains in demand in 2017. Some current pendant lighting draws inspiration from the past, while other pendant lamp styles are uniquely contemporary in design. “Urban industrial” is a relevant style trend for 2017. If this is your decorating style of choice, you’ll want lighting that captures the mood. Pictured here is an on-trend indoor / outdoor galvanized steel barn light that makes an ideal complement to the industrial style aesthetic. If you’d prefer a different finish, the same light fixture is also available in black, red and white. “RLM” is an initialism that could mean multiple things. In regards to interior light fixtures it means “reflector luminaire manufacturer”. These initials can also refer to “reflected light microscopy”, a fascinating science for examining reflective metallic and other surfaces. The common element: downward-pointing lights are central to both types of RLM. RLM light fixtures weren’t originally intended for residential use. 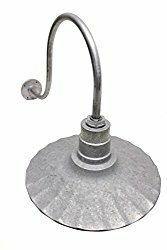 They are the downward-pointing commercial / industrial light fixtures you’d typically see in business locations: restaurants, shopping centers, hotels and warehouses. This type of lighting evolved because of a need for diffuser-free light fixtures that reflect light downward. RLM lighting commands a relatively small share of the residential lighting market, but it is currently trending up. Lighting expert Randall Whitehead attributes its upswing in popularity to the fact that some communities are adopting Dark Sky ordinances. Dark Sky ordinances? I had no idea what that was all about, so I decided to research it. That turned out to be a thought-provoking rabbit trail. Have you ever had someone turn a bright light on when you weren’t prepared for it? After that experience, you’re surely aware that light can be invasive. Yet perhaps you hadn’t given much thought to the possibility that light could be a pollutant — or that excess light could be harmful to people, the environment or wildlife. If these concepts are news to you, you aren’t alone; they certainly hadn’t entered my mind as possibilities. In a nutshell, the Dark Sky ordinances are part of a larger initiative to reduce light pollution. People who are concerned with light pollution and its effects are taking steps to reduce it — and, apparently, RLM lighting is a popular solution with this crowd. The goal is to focus light exactly where it is needed and eliminate wasteful use of light where it is not needed. RLM light fixtures do exactly that. They can be wall mounted, bracket mounted or pendant mounted, allowing you to focus light in the spots you want to illuminate. Regardless of where you stand (or don’t stand) on the issue of light pollution, being able to focus light where you need it is a good thing — so RLM light fixtures are worth taking a look at. While it isn’t a bad idea to put a chandelier in your foyer or dining room, you don’t need to feel like your chandelier placement is restricted to only these areas. Feel free to get creative. Some interior designers are moving chandeliers out of the dining rooms they decorate and moving them into kitchens instead. According to the American Lighting Association, chandeliers are making appearances in unlikely spaces like bathrooms and walk-in closets. In general, there are a couple of other clear trends emerging in regards to chandeliers. Don’t you hate it when your cabinets or drawers are so dark that you can’t see the contents, and you can’t find what you need? Tired of using a flashlight when you need to venture into a dimly-lit space? Well, trendsetters these days have found elegant solutions to that problem: they’re adding lighting inside those formerly-dark spaces. In many cases, when you open a drawer or cabinet, the light inside is triggered to instantly turn on. Shower lights have been popular in the bathroom, and they continue to remain relevant as we head into 2017. So that’s the inside scoop on lighting trends for 2017. Now that you’re updated, you can use this information to ensure that you choose lighting that’s both on trend right now and also suitable for your family’s style and preferences. We wish you a brightly-illuminated, dazzling and prosperous 2017. Happy decorating! National Kitchen & Bath Association Design Trends Survey Forecasts More Spa-Like and Accessible Bathrooms. At the American Institute of Architects: Kitchens and Bathrooms Go Upscale. Article is by Kermit Baker, AIA Chief Economist. Homeowners Ramp-Up Spending on Kitchen and Bathroom Design, posted at the American Institute of Architects Website. At the American Institute of Architects: With Upturn, Homes Are More Specialized and Technologically Savvy. Article is by Kermit Baker, AIA Chief Economist. Lighting Trends for Kitchens and Baths. This article is by Mark L. Johnson, posted at the Residential Lighting website.